The memo below outlines potential strategic decisions ESPN could make going forward, and evaluates two strategic choices, each against two different market scenarios – including a downside scenario. In a recent note, we detailed the issues facing ESPN and provided an overview of its current situation. In this note, the Trefis Team has put together a strategic analysis regarding ESPN’s path forward in the face of secular headwinds. Executive Summary: Launching a standalone streaming app could help ESPN offset subscriber declines driven largely by cord-cutting and secular pressures. We believe that many cord-cutters would be willing to pay for a standalone ESPN app if one were available, and may actually be willing to pay more than the estimated $7.21 per subscriber per month that the network currently charges. This could help maintain – or even expand – margins, which is important as the company’s massive content deals are largely fixed in nature. We estimate that this could lead to 6% annual revenue growth and a slight expansion in EBITDA margins, allowing operating profits to rise at an even more rapid pace. Here we consider outcomes under two scenarios: a base case, and a rapid decline scenario. Subscriber base to shrink: We expect ESPN’s subscriber base to decline by ~2.5% annually over the foreseeable future, as a result of cord-cutting trends. Average subscription fees will increase: ESPN’s exclusive content lineup should allow the network to pass on higher operating costs to subscribers – resulting in average monthly subscription fees increasing by roughly 5% annually. Content costs will jump in 2017: ESPN’s costs from contracts for broadcasting rights was around $4.7 billion annually over 2013-2016, but will likely jump to over $5.8 billion from 2017 on and will remain at that level going forward due to the long-term nature of the deals. Other operating costs to grow steadily: While content costs form a large chunk of ESPN’s operating costs, the network also incurs considerable production expenses, in addition to marketing and other general administrative expenses. These costs were roughly $4 billion each year over 2013-2016, and we expect them to grow at ~4% annually going forward. The table below highlights our forecast for key operating metrics at ESPN under the base case scenario. ESPN’s current strategy has a very clear risk associated with it: if subscription fees are raised too quickly, then it could trigger a faster reduction in the subscriber base (though this is mitigated to an extent by a lack of “a la carte” packages at most pay-TV providers). 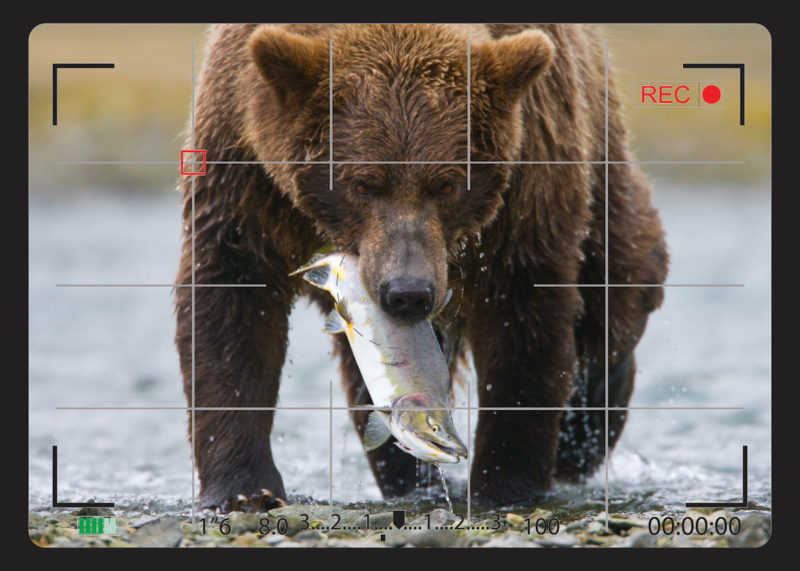 We capture this as the “Rapid Decline” scenario in our analysis. Under such a scenario, ESPN may ultimately have to cut back on its fee hikes due to cord-cutting pressure. It should be noted that while 60% of ESPN’s revenues come from subscription fees, the remaining 40% (advertising fees) are also indirectly linked to the subscriber base. A shrinking subscriber base makes ESPN less attractive to advertisers – in turn hurting advertising revenues as well. Subscriber base to shrink faster: ESPN’s subscriber base declines by ~5% annually over the foreseeable future. Content costs remain identical to base case scenario: ESPN’s costs from contracts for broadcasting rights will remain constant at $5.8 billion over 2017-2020, and increase to over $6 billion in subsequent years. A potential solution to ESPN’s subscriber loss problem is a streaming app that provides internet-only access to its content at a per month subscription cost. As we pointed out earlier, a key factor behind ESPN’s shrinking subscriber base is cord-cutting among cable TV subscribers as they switch to cheaper internet-based options. A dedicated ESPN streaming app could be priced appropriately to attract the price-conscious section of consumers who are unwilling to pay bloated monthly cable TV fees, but still want to watch their favorite live sports content that is exclusively available on ESPN. A key decision ESPN would have to make in this strategy is the appropriate subscription fee for such a streaming app. As ESPN is available as a part of bundles offered by popular existing internet-streaming platforms such as Hulu, Sling TV and DirecTV, the fee has to be largely similar to the price subscribers currently pay for an add-on ESPN package. At the same time, the fee cannot be too low, as it may not be enough to cover the fixed content costs as well as incremental operational costs linked to the streaming app (like additional infrastructure and related costs) in the long run. Another important criterion ESPN has to keep in mind while picking a subscription fee will be the potential cannibalization of traditional subscription revenues by the streaming app. After all, some existing and potential subscribers of ESPN’s cable TV offering could use the opportunity to switch to ESPN’s streaming service in an attempt to reduce their overall monthly cable bills. Again, here we consider outcomes under two scenarios: changes due to a new streaming app on ESPN’s performance under the base case scenario, and also the combined scenario, which captures the impact of a new streaming app under the rapid decline scenario detailed above. 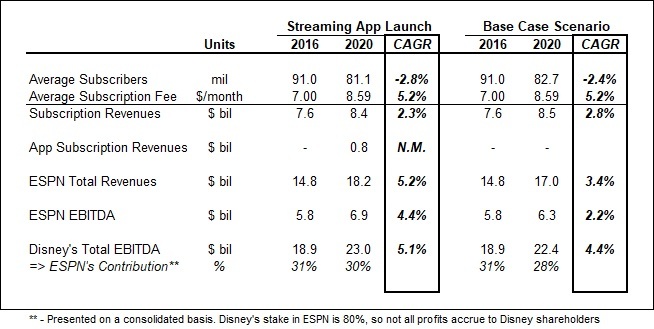 We model the impact of a new streaming app on the base case scenario in our analysis of ESPN under the “Streaming App Launch” scenario, wherein we include revenues and expenses associated with the streaming service complementing our base case scenario. We include the negative impact on traditional subscription fees, as detailed above, through an “App Cannibalization Factor” in our analysis. We also estimate the positive impact of the app on ESPN’s advertising revenue (as the app represents a potent advertising platform for ESPN) in the model. App Subscriber Base to grow rapidly: Assuming ESPN launches the app by the end of 2017 (which is unlikely, but assumed for the sake of simplicity), we estimate ESPN’s app subscriber base can potentially grow to over 8 million by the end of 2020. App Subscription Fees scale up gradually: We believe that ESPN could potentially charge app subscribers $10 per month to begin with, and gradually increase the figure by about 4% annually over coming years. Streaming-related costs would be high initially, but normalize down the line: The launch of a new streaming app would entail sizable upfront costs for ESPN in terms of setting up the necessary infrastructure to provide a good viewing experience to subscribers. Further, the infrastructure will also need to be scaled up as the subscriber base grows. As ESPN achieves critical mass after a few years, these costs would fall drastically as a percentage of revenues. We estimate incremental app-related costs to stabilize around 20% of total app-related revenues in the long run. It should be noted that this is primarily because content costs are not a part of these expenses – ESPN will incur content costs regardless of whether it offers a streaming app or not. App cannibalization factor assumed constant at 25%: This implies that 25% of the new subscribers added by ESPN’s streaming service over any given period are existing or potential subscribers of ESPN’s traditional cable TV channels. This factor, therefore, captures the direct impact of the streaming app on ESPN’s core subscription revenues. As a part of our “Combined” scenario, we detail the mitigating impact of a new streaming app on ESPN’s performance even if its core subscriber base shrinks along the lines of what we forecast under the “Rapid Decline” scenario above. The following table shows how ESPN’s revenues and EBITDA would look if it continues to lose subscribers rapidly. Notably, the cannibalization impact of a new app will likely lead to a faster decline in the subscriber base under this scenario, with the average number of subscribers shrinking at more than 6% annually compared to the already high 5.5% under the Rapid Decline scenario. However, the negative impact of this on core subscription revenues is more than made up for by revenues from the new streaming app and also by the potentially higher advertising revenues. 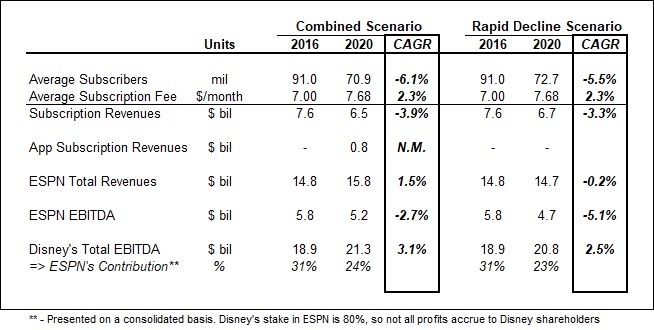 As shown below, ESPN’s total revenues would actually increase going forward under the Combined scenario, as opposed to the overall decline projected under the Rapid Decline scenario. The streaming app cannot completely counter the sharp reduction in EBITDA under the Rapid Decline scenario, though, as additional costs linked to launching and running the standalone app will weigh on profits. But the annual decline in EBITDA in the Combined scenario (2.7%) is well below that for the Rapid Decline scenario (5.1%). The app, therefore, would partially cushion the impact of a sharp increase in cord-cutting on ESPN’s bottom line – and can potentially reverse the trend (and expand EBITDA) in the long run. To conclude, an ESPN streaming app would likely have a sizable positive impact on the network’s long-term revenues and profits, and would add long-term value despite the incremental direct and indirect expenses associated with a streaming app.